On March 2, 2015, multimedia filmmaker Jeanne Liotta presented a lecture entitled “The Real World At Last Becomes a Myth: Ruminations on Art and Science.” The title, she explained, was a reference to How the true world became fiction? from the Twilight of the Idols by Friedrich Nietzsche—and in her lecture she examined how media-making shapes our perception of the “real,” empirical world. 1. Liotta’s concept of integrating art with science and our perception as “sample audience” to her approach of communicating complex science matter through film. 2. The aesthetics of Liotta’s work and what we got out of it as non-science oriented audience. 3. Liotta’s best work and her awards in the genre of experimental film. The paper will then conclude with collective insights on some of Liotta’s work as successful examples of experimental films. When we looked at Liotta’s work prior to the lecture, we weren’t quite sure how to “read” it, or how to understand the means by which it was made. Her lecture, however, provided helpful context regarding her methods, which helped us understand her technique and appreciate the aesthetics of her work. Liotta, who regards her work as a fusion of science and filmmaking, made several references to her love of the stars and the cosmos. Given the widespread fascination with astronomy, we weren’t surprised to find that the audience seemed enamored with this work. The focus within the majority of her works is on this intersection of art and science. Her most recent body of work, The Science Project, encompasses a constellation of mediums that present an intersection of art, science, and natural philosophy. Her longest project Observando el cielo, from 2007, examines our relationship with space, using seven years’ worth of night-time recordings of the sky. Some viewers, seeing the “natural” imagery in Liotta’s work, might approach it as scientific documentary—and might then be frustrated with her lack of a clear, didactic message. Yet even for those for whom the “message” is unclear, the aesthetic value of the work is apparent: one can’t help but appreciate the beauty of her layered imagery and the nuanced composition of each shot. Aesthetics refers to principles governing the nature and appreciation of beauty. Liotta’s appreciation for the aesthetics of science—and her dedication to capturing those aesthetics in her own work, often through several-year-long research and production processes—shone through in her presentation. When we asked her about the challenges of producing such complex imagery, she said: “I believe my job as an artist is to create something that makes people feel more connected to the universe.” Her signature film Observando El Cielo was completed in seven years, Crosswalk took eight years, and her most recent project, Soon, was completed in one year to mention a few. Liotta experiments even with the “science,” the physics and chemistry, of the image itself—even her own images. For example, “Loretta” was a piece of work she had produced using a “cameraless” process. She explains how she produced a photograph by placing a 35mm negative on top of raw 16 mm stock and then exposed it frame by frame with a flashlight—a process known to experimental filmmakers as a “photogram.” She reminds us that artists will always push their methods beyond what any sophisticated camera can offer—and it’s in this human extension of the machine that we find the most innovative and captivating work. Another great example we found was Hephaestus of the Air Shaft. Through the course of this film she uses an assortment of shots, all from the same position. She opens the film with a blank screen and a buzzing noise, then transitions into a wide shot out a window, where a man hanging on a chair in the adjacent building is doing what looks like some metal work. The next shot is a medium shot where you see the metal worker measuring the wall; she then zooms out to reveal the location of the shot. 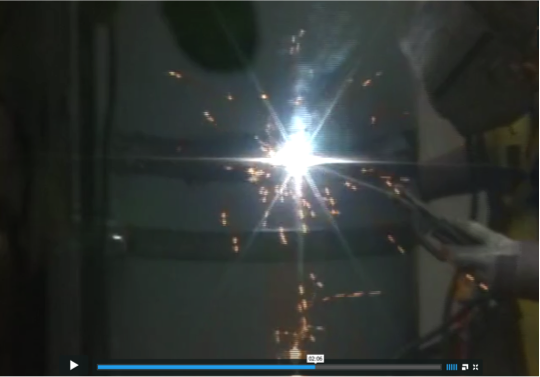 At one point, the focus goes from the metal worker to the welding tool causing the spark, which looks much like a star. Given Liotta’s fascination with stars, one could claim that maybe on some level she was experimenting with different optics and was trying to find celestial events in human labor on earth. The use of light and shadow, framing and composition—including the framing of some shots with household plants, which created a sense of enclosure — along with a mix of grating machinic sounds and ambient music, created a simultaneously mythic and quotidian feel. Such an feeling is only appropriate for our Hephaestus, the “blacksmith of the gods,” in a mundane airshaft—a myth brought down to earth. Over the previous 10 years, science and astronomy have been subjects in most of Liotta’s work. Observando El Cielo, a film that resulted in seven years of recording the cosmos, won the 2008 Tiger Award for Short Films at Rotterdam. It was acknowledged as one of the best in the decade by The Film Society of Lincoln Center. Another significant piece of work that displayed Liotta’s range as a filmmaker is the critically acclaimed Crosswalk. In this particular work, she stepped out of the realm of science into the spiritual to film a series of Catholic processions that took place on several consecutive Good Fridays. She captured and documented various people for eight years as they took to the streets on the Lower East Side for the Easter celebration. This film adopted a new scientific lens – that of the anthropologist observing the rhythms and traditions of a culture progressing over time. 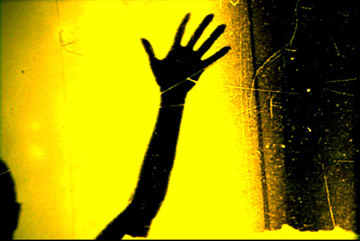 Liotta’s experimental uses of slide projections, rayograms, and other unique techniques of image creation can vary from one piece to the other. However, her work process seems to have a consistent element throughout—that is, the timeframe she sets or takes to complete her pieces. Her process alone makes her a scientist herself—one who uses film as a medium for her experiments. She observes her world – whether natural occurrences or human behaviors – and she gives each project one a sufficient amount of time, allowing her ideas to develop. This is Liotta’s process, her “science.” No shot, piece of sound, color choice or transition ever goes to waste, because in the end they all have a purpose and function in communicating their message while producing aesthetically pleasing work. Liotta’s lecture was, for us, an eye opener: it revealed how the medium of experimental film affords a massive range of techniques to simply express a thought or tell a story. While, given the scientific subject matter of her work and her experimental process, we might characterize her work itself as a science. On the other hand, Liotta’s work can also be characterized as “abstract art.” Her films can be regarded as abstract audio-visual assemblies that were collected over a long period of time. Even if the “results” of her scientific method are inconclusive, the aesthetic value of her work is undeniable: one can’t help but appreciate the beauty and distinct composition of her imagery, as well as her commitment to such long-term productions. We leave you with a question Liotta posed in her lecture that is: “What is considered art?” Is it about the process of the artist and the aesthetics of his/her work? Or can it be considered a multidimensional and a subjective field where the work is an invitation for the viewer to connect in one way or the other to the artist’s world? Smith, S. The enlightenment of Jeanne Liotta. Citizen Science. 02.17.2012.